This 24-foot caboose was originally built with a cupola for the Northern Pacific as their #1730 in 1921 by Pacific Car & Foundry. The 24-foot caboose design standard first appeared on NP in 1907 as a block of one hundred cars numbered erratically in the 1000-1300 series. A later lot of cars numbered in the 1600 series were rebuilt from 19-foot cabooses. By 1917, there were 328 24-foot cabooses on the NP roster. The last group of 24-foot cabooses were numbered in the 1700 series beginning in 1921. #1730 was contained within this lot. 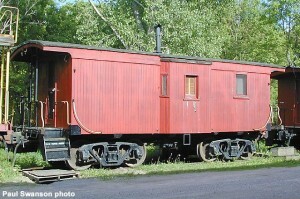 In 1966, the caboose was sold to Minnesota Transfer Railway Company. Its condition was well-worn, the cupola framing and rods were loose. So MT rebuilt the caboose by removing the cupola and adding bay windows. All interior partitions, the icebox, and lockers were removed. Two walkover-type coach seats were installed by the new bay windows, along with two new coal bunkers and a conductor’s desk. The caboose was renumbered X12 at this time. A sister caboose at Mid-Continent, NP #1781, is a good example of how the car appeared before it was rebuilt by Minnesota Transfer. #X12’s service life on the MT was short-lived. In 1967, MT’s switchmen agreed to ride in engine cabs between Hennepin Avenue and New Brighton and within the yards instead of the cabooses. The railroad quickly saw the savings of not having to switch a caboose into trains, nor servicing them. MT’s caboose fleet was retired. One by one they were either sold or disposed. In 1971, X12 was sold to a museum member for $150 and moved to North Freedom in March of that year. The car is maintained in the paint and lettering scheme it wore while in service on the Minnesota Transfer and is presently used for bunk facilities.